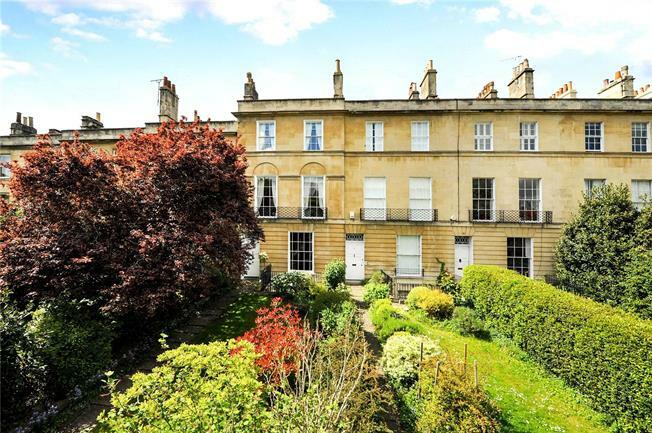 4 Bedroom Terraced House For Sale in Bath for Offers in excess of £1,000,000. The entrance hall of this superb Regency townhouse is quite unique, with Bath stone flooring, a beautifully detailed cantilevered stone staircase as well as ornate plaster cornicing. The ground floor kitchen is open to the dining room, providing the perfect practical layout for a five storey home. Full height Georgian sash windows overlook the pretty front garden providing a picture window of different shades of green. Working shutters, a stone fireplace and simple plasterwork in the ceiling adds to the style. Wooden floorboards continue into the kitchen with fitted units under granite work surfaces and a gas fired Aga creates a warm and welcoming room. Once again sash windows with working shutters remain, and offer a view of the rear garden. The lower level also benefits from flagstones in the hall which lead to the courtyard to the front. There is a spacious front bedroom with an en-suite bathroom including a free standing claw foot bath, whilst to the rear the original kitchen is now an office. There is also a vaulted utility room and an exterior storage vault. Up on the first floor the drawing room is elegant with tall corniced ceiling, two full height sash windows plus a handsome fireplace with a marble surround and cast iron inset for an open fire. A door links with the withdrawing room again with a central fireplace and sash windows to the rear. The second floor houses two bedrooms; there is a cloak room and bathroom on half landings whilst the top floor has a shower room and fourth bedroom. Beaufort West is a handsome terrace dating from the Georgian and then into the Regency period. The houses are fronted by private gardens and situated on the east side of Bath. Larkhall is situated just around the corner and has a wonderful community atmosphere centred around the square. The popular amenities include a local theatre, both primary and secondary schools and St Saviours Church. There are a number of shops including butchers, grocers and delicatessen plus a small supermarket. This popular location is approximately one level mile walk into the city famed for its Georgian architecture and Roman heritage. The attractive façade of this charming townhouse is fronted by a pretty garden. There is the path and enclosed hedge on one side and a lawn to the other with mature shrubs and hedges to the front and side. The lower ground floor has a small courtyard. The garden to the rear is enclosed by mellow Bath stone walling. A stone terrace is adjacent to the house and with good access from the kitchen is perfect for alfresco dining. There are a couple of steps up to a small level lawn bordered by flowers and climbing plants. There is rear access to the garage with vehicular access from St Saviours Road, a real asset for a period townhouse in Bath.